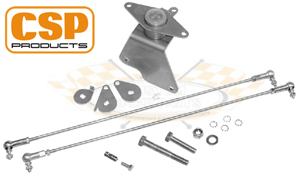 Stainless Steel CNC-machined bellcrank linkage for Porsche Style Fan Systems on a Type-1 engine. features two ball bearings for smooth operation. Pullrods have left and right hand thread for easy syncronisation. For use with Weber 48 IDA Type carbs. This is the finest quality linkage.